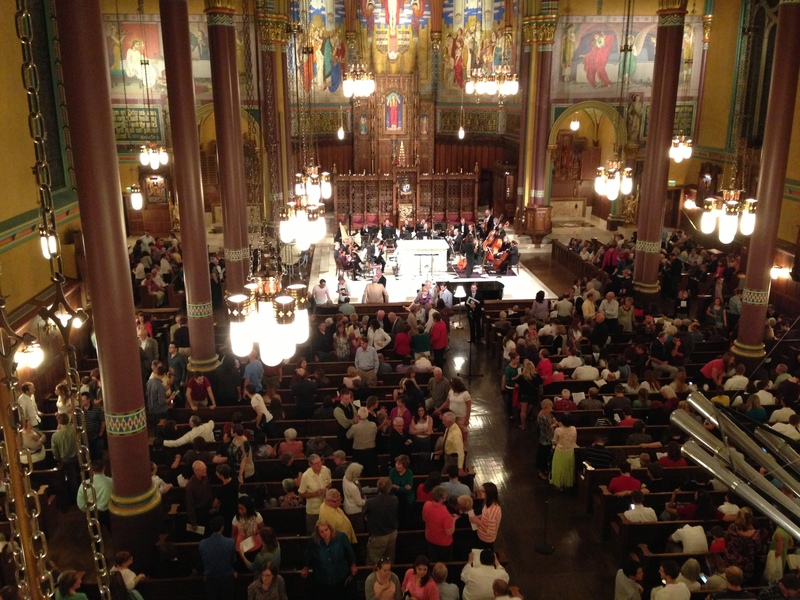 View from the organ at the Cathedral of the Madeleine during intermission Monday, September 16th. The Cathedral of the Madeleine opened its doors Monday evening to members in the community to come and enjoy not only the inspiring beauty of its structure, but as well, the stunning and moving talent of the Utah Chamber Artists and other musical guests under the direction of Dr. Barlow Bradford. I’m still feeling blown away by the astounding music I had the pleasure to experience over an hour after returning from the concert: Voices. The evening began with an intense and stirring performance of “God of Our Fathers” by both the choir and orchestra and even the audience was included in singing one verse. The echoes of the falling and rising melody of a multitude of voices was an all encompassing experience for one standing in the middle of the Cathedral. The concert continued with a violin solo by David Porter, who played “Gavotee en Rondeau from Partia No. 3 in E Major for Solo Violin” by Bach. The lights dimmed during this performance and the glow from the outside street lights sparked the stained glass windows to illuminating life. The soothing tone of the violin that filled the walls of the cathedral along with the exquisite religious glass scenes shining overhead made this performance nothing short of magical. The concert offered an array of musical performances including piano and organ solos, orchestral pieces, choral arrangements, vocal duets and solos and more. A variety of composers were represented from all over the world, ranging from the world-famous Bach, Benjamin Britten, and Italian Carlo Gesualdo, to more contemporary composers such as Dale Warland, and the Latvian Vytautas Miskinis and Eriks Esenvalds. Arrangements by director Dr. Bradford of more familiar hymns were also performed. A span of styles from clear and sweet to powerful and complicated was shared. I felt I was at a dessert buffet, getting the chance to get a taste of each treat and still wanting more. The concert moved quickly from piece to be piece as lighting director, Christopher Dance, highlighted the different performers who moved throughout the cathedral. This wasn’t your typical choral concert with the choir standing at the head of the hall. Different performances were held in an assortment of areas in the main hall of the cathedral, giving the audience, no matter where they were seated, the opportunity to have front row seats for a song or two. This kept the concert very fluid and engaging. Many pieces stood out to me for various reasons. I found Miskinis’s “Pater Noster,” which was the Lord’s Prayer sung in Latin, haunting with its interchanging parts and multiple rhythms. I was amazed by Jason Hardink’s remarkable piano solo of Bach’s “The Concerto I in D minor, BWV 1052.” The program described this performance as “the very challenging first movement” of this particular concerto. “Very challenging” seemed like an understatement to me. Having taken a few piano lessons in my life, I can at least understand the skill and precision that was required for the flying scales and chords of this beautiful song. The second half of the concert brought a strong solo by baritone Michael Chipman, who sang “Sanglots” by Francis Poulenc. The lyrics of the song were comprised of poems by poet Guillaume Apollinaire, a French Surrealist, who focused on the moods and emotional range of human love. I also enjoyed the Salt Lake City premiere of the contemporary choral piece “The Voices” by Dale Warland. The harmonies of the choir were rich and the accompaniment of John Eckstein on the cello was poignant. The poetic lyrics that were printed in the program were thought provoking, which added great depth to this song. I found the “Cantus in Memoriam Benjamin Britten” by Arvo Part, performed by the string orchestra and bells, absolutely gorgeous. It was easy to get lost in the descending scales that felt like serene waves flooding the hall. Melinda Kirigin-Voss and Melou Stewart Cline sounded angelic in their breathtaking duet in “O Salutaris” by Eriks Esenvalds. This seems quite fitting considering this is part of “the sacred music repertoire of Roman Catholicism,” according to the program. The choir wove rich harmonies that sustained and supported the two main vocalists. The evening ended with the lovely “Sine Nomine” arranged by Dr. Bradford. The audience was again invited to join in on some of the verses of this hymn. Though most audience members don’t have the vocal range of those in the choir, the many voices singing together still filled the whole space with joyful “Alleluias”. Overall, the whole concert was splendid and enriching. I felt uplifted as I left the cathedral that night. I don’t think I was the only one who felt this way, as I heard snippets of conversations from others in attendance. In my opinion, I felt the first half of the concert was stronger than the second half, but still both sections were beautiful. The Utah Chamber Artists will perform one more evening for the community on Tuesday, September 17th at 8pm in the Cathedral of the Madeleine. Not only do they give a stunning performance, but this is their one free concert each year. This evening’s concert is an opportunity that members of the community should not pass up. The Cathedral of the Madeleine is located at 331 East South Temple in Salt Lake City. The concert is free so we suggest you arrive early, and since the seating is wood benches, bring a soft jacket to sit on. Jannifer Hemingway Wood is a native of Utah and currently resides in Salt Lake City with her husband, Danny. She is an avid reader, writer, hiker and pretends to be a photographer when out exploring Utah’s beautiful nature. She graduated from BYU with a bachelors in Communications – Broadcast Journalism and is currently employed as a producer in the photography division of The Church of Jesus Christ of Latter-day Saints. She has written for a variety of blogs and websites on the side and reviews local productions for the Utah Theatre Bloggers Association.